BTN announcer: "Brown spinning into the lane and hits." My wife: "AND spinning into our hearts." Happ gets the hockey assist on Showy's three. I'm counting it. #Badgers have a 19-11 lead with 7:52 left in large part because Huskers aren't good. UW 6-19 shooting (was 4-9). #Badgers lead 19-11 with 7:52 left until halftime. At least the teams now have more combined made field goals (11) than fouls (10). Nebraska has hit 2 of its last 10 FGs (0 pts last 2:36). Vitto Brown with a game-high 7 points for the #Badgers . Wisconsin leads 19-11 at 7:52. Vitto Brown is 3-for-6. His teammates are 3-for-13. Nebraska with eight turnovers. #Badgers Showalter has hit 2 of 3 from deep and Brown is all over glass. Has 4 boardsd and two assists. U-8 TO: #Huskers pulled to within 14-11, but Wisconsin has run off five straight to lead 19-11. Both teams are shooting under 35 percent. #Badgers shooting 31.6 and lead by 8 with ball OB. Vitto Brown has made as many shots as the rest of #Badgers combined w/ under 8 to go. This is not a drill, people. Take shelter. Hoard food. The #Badgers are 3 of 8 from 3-point range and 3 of 11 from inside the arc. Did I mention the Huskers have 8 turnovers? Brown has two fouls, but he'll stay in for now. #Badgers Brown gets second foul with 7:23 but stays in. Hayes back in with two fouls, 6:52 left. Brown picks up his second foul but obviously stays in because he's the *coughs four times* best offensive player out there. #Badgers went zone that last possession. 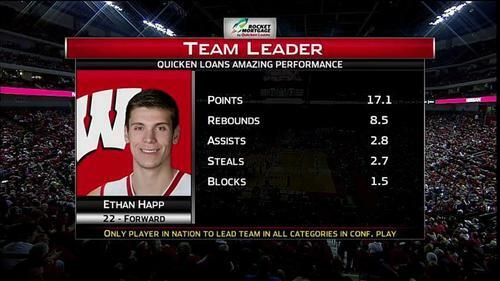 Is that good, @BadgerMBB ? The Wisconsin Badgers Men's Basketball team is playing zone defense in this, the year of our Lord, 2017. What a time to be alive! 7-0 run for Nebraska to make it 21-18 UW with 4:55 remaining in the first half. The Badgers are looking disjointed and dare I say...#bad . Thankfully Khalil Iverson (????) stops the bleeding and gets the Badgers back on track with a spinning deuce. #Badgers lead 23-20 with 3:58 left until halftime. UW 8 of 23, Nebraska 9 of 24. Huskers making a run, cutting an 10-point deficit to 23-20 at the U-4 TO: Watson and Webster have combined for 9 points. Things have tightened up in Nebraska as we approach half. #Badgers 8-for-23 from the floor; Huskers 9-for-24 FG. #Badgers had a 21-11 lead, went zone, NEB scored back-to-back to get mo and lead is now 23-20 with 3:58 left. Nebraska straight working the Badgers on the glass tonight. Luckily the turnover battle is heavily in Wisconsin's favor. Great minutes from @roby_isaiah in the first half. 5 rebounds, 2 blocks, 1 steal. 19.6 seconds left in the half. #Huskers use their use it or lose it timeout to set up a final shot of the half. Seven empty possessions in a row for the #Badgers , who lead 25-22 with 19.6 seconds left until halftime. #Badgers reached the 25-point mark with 3:53 left on a tip by Thomas. We have 19.6 seconds left and UW stuck on 25. Timeout Nebraska. Huskers will get the last shot before half.